While most SFU students probably have at least a basic knowledge of Louis Riel, the controversial Métis-Canadian who led two rebellions against the government in the 19th century, his name holds a very different meaning at our school than anywhere else. The majority of utterances of the words “Louis Riel” on our campus are in reference to Louis Riel House, one of SFU’s oldest residence buildings and, quite frankly, one of the most awful places at our school. Mouldy walls, rotting wood, bursting pipes, non-functional heaters — Louis Riel has become synonymous with the worst of SFU. As residents of the building have slowly been forced to leave and rumours circulate that the building may soon be closing, Simon Fraser looks like it may finally be erasing the name “Louis Riel” for good. Forty-six years ago, though, our school almost became Louis Riel University. 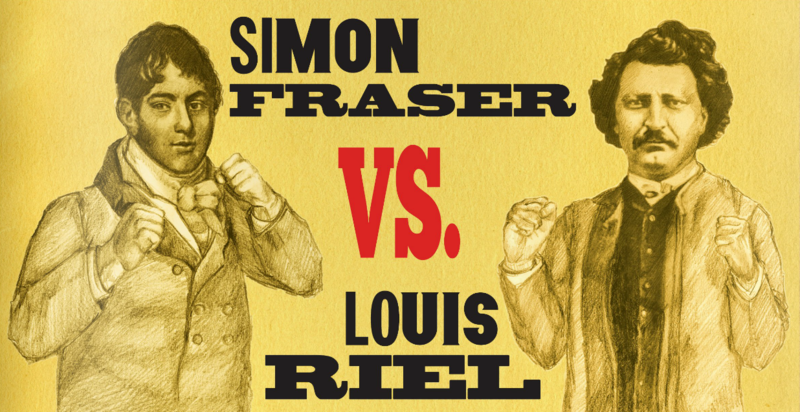 Although the two men never met and neither one of them ever even set foot on the land in which our school was built, Simon Fraser and Louis Riel have a long and storied rivalry at our campus. These two names just don’t like each other one bit. When British Columbia’s newest university opened in 1965, it already had a name with a story. It was of a “Loyalist, fur trader, and explorer” who in 1808 “completed one of the greatest journeys in the annals of Canadian history by descending the mighty river which today bears his name,” lore which was plastered all over the university. His name was Simon Fraser, and while his legend may sound impressive, the way he became associated with the school is far less extraordinary. Unlike James McGill, another fur-trader who earned himself the title of a Canadian university by putting up the money to make it happen, Fraser was in no way a benefactor of SFU and had no history of supporting education. Instead, he earned his spot because someone didn’t want to leave blank spaces in a document. That person was George Curtis, the dean of law at UBC. In early 1963, under the command of premier W.A.C. Bennett, Curtis drafted the legislation which allowed for the creation of a second university in the greater Vancouver area. Curtis initially wrote the school name on the form without much thought, and, quite logically, called it “Fraser University” after the river that opens up the metropolitan area that the school would be serving. While the name certainly sounded better to the committee working on the project than previous working titles “Mainland” or “Delta,” Sperrin Chant, the dean of arts at UBC, was the first to realize the unfortunate acronym they had almost created. “Do you really want a crowd yelling FU at your football team?” Chant asked, so Curtis decided to add the first name of innocuous explorer Simon Fraser, for whom the river is named, for the purposes of euphony. Unbeknownst to them, this simple decision to avoid a profane chant would end up stirring the pot for a radical student government to attempt to tear the name — and school — apart. This was the message that the student council’s second vice-president John Conway and arts-representative Richard Apostle brought to the SFSS’ Executive Council meeting on June 24, 1968. The pair were part of the most radical student government in our school’s history, with the majority of the members belonging to the rapidly expanding Students for a Democratic University (SDU) organization which opened a chapter at SFU in January of that year. The SDU were a self-proclaimed group of radicals who wanted to create an alternative system of education and a democratized university that would play an activist role in society. They were decidedly anti-establishment and anti-administration; that summer, they also became anti-Simon Fraser. Although the university was already embroiled in a number of controversies in the summer of ‘68, it was the school’s name that particularly concerned Conway, a PhD student who had previously been a high-profile student activist in Saskatchewan and had only arrived at SFU that year. He believed, and had a number of sources to back it up, that the man for which SFU was named was not a hero at all, but was in fact an illiterate racist, who destroyed Aboriginal culture without hesitation. For Conway, continuing to have the school named for such a man was a celebration and legitimization of the worst parts of Canadian history. Beyond his racism, Conway also claimed that Simon Fraser did not even discover the Fraser river — several explorers had beaten him to it — and that the only reason he was ever here was the result of a failed attempt to get to the Columbia. He demanded that SFU be re-named Louis Riel University. While Riel’s name may have meant more in Conway’s home province of Saskatchewan, or in Manitoba, the province Riel founded, Louis was a controversial figure even as far west as BC. While debates over Riel’s actions and sanity live on to this day, Conway and the rest of student council were convinced that he was a much more deserving figure than Simon Fraser. The motion to demand that SFU become LRU was carried 6–2 by council, and in subsequent meetings they also agreed to authorize the expenditure of approximately $107 for the manufacture of one thousand “Louis Riel University” buttons, to be sold on campus. Furthermore, they allowed the creation of an informative — albeit biased — flyer about who Fraser and Riel were. It was co-written by Conway and fellow ‘LRUSS’ vice-president Jim Harding and provided a more detailed description of the reasons behind the movement. In a section of the flyer entitled “Why Louis Riel University,” it was explained that the name change was necessary to promote a re-interpretation of Canadian history and diminish the “deadly provincialism” which existed in BC. They believed that the name Louis Riel could create a link between the province and an important figure of both native and French Canadian history of which they said the northwest remained generally ignorant. The publication also revealed the SDU’s own believed connection to the name, as they wrote that the “demands here for democratization of the campus, amounting to representative and responsible government in this institution” directly related to the life of Louis Riel. For Conway and Harding, Simon Fraser represented a negative colonial history that they believed was being mirrored at SFU by the authoritarian leadership of chancellor Gordon Shrum and president McTaggart-Cowan. They wanted Louis Riel as he was a more inspiring namesake that would better suit their own rebellious spirit. As they would soon learn, however, they may actually have been a little too similar to Riel. Even their name-proposal was destined for the same fate as their hero, a swift killing at the hands of unsympathetic white men. The summer of 1968 was one of the most volatile times in SFU’s history. After ousting their inaugural president, the university cycled through three presidents over the course of three months; the school was put under censure from the Canadian Association of University Teachers (CAUT); and the SDU held countless rallies and protests demanding more democracy at the university. But only one of these rallies raised questions of impeachment of the student council. It was the Louis Riel issue. Despite selling over 500 “Louis Riel University” buttons and making headlines in The Province and the Vancouver Sun, Conway did not quite have the support he thought. Local papers received several responses to the proposed name change, immediately following their coverage of the proposal, with the public expressing varying degrees of bewilderment and outrage. Mrs. Ann Hanley of White Rock BC wrote in to the Sun and accused Conway and SFSS president Martin Loney of being “completely off their rockers.” She contended that Louis Riel was a poor choice and had no connection with BC, and that Simon Fraser did not mistreat native people, citing her master’s degree in Northwest history as proof. Even those who agreed with Conway on Fraser’s legacy did not all love the idea. Andy Robb, a graduate student in History, wrote an article in The Peak that did not argue with their assessment of Simon Fraser but took issue with the choice of Riel. He informed Conway that Riel was not a positive figure in the history of native people, and that he actually had a rather flippant attitude towards any non-Métis that nearly rivalled the racism of Simon Fraser. While he wasn’t against a name change, Robb simply thought they could do better than Riel. A third perspective suggested that instead of doing better than Louis Riel or Simon Fraser, they could just find a better Simon Fraser. In his letter to the Sun, concerned citizen R.S.T. Fraser told the council that there were plenty of other “Simon Fraser”s to pick from, including Simon Fraser, Lord Lovat, who attended the opening of the school in 1965 on behalf of the Fraser clan in Scotland. After several weeks of debate and campaigning for and against the Louis Riel name, a student meeting was finally held on Wednesday July 10th in convocation mall. The outcome could not have been more disappointing for Conway and the SDU. After a three-hour rally, a crowd of 300 — which had dwindled down from 800 at the start — raised their hands to show three-to-one support for the name Simon Fraser. While President Loney tried to insist that the issue was only up for discussion at this stage, the crowd became unruly and student Robert Danielson countered with a motion of confidence in the Simon Fraser name. After some debate which included comments from Robb, Harding, and Marie Baker, an Aboriginal student, the vote killed the name-change. To add insult to injury, Danielson then swiftly put forward a motion of non-confidence in the student council. The following week, student John Misera presented council with a petition bearing 138 signatures in support of taking Danielson’s motion to a vote. Two-thirds support in the motion would have meant impeachment for the council. While president Loney claimed that the Louis Riel issue was simply being used as an excuse by those wanting to impeach a council that was in favour of radical action, two things were clear at this moment: the SDU’s days in charge of the Simon Fraser student body were numbered, and Simon Fraser would remain Simon Fraser. Although the SDU maintained control of the student council for the rest of the summer semester, come fall they were replaced by a more moderate group. While the craziness at SFU wasn’t quite over, Louis Riel University was now nothing more than an idea which existed in the minds of few dejected students. While proposed referendums to get a wider student vote on the name change never came to fruition, the Riel name would come back a few years later — without a vengeance. In August 1969, potential tenants of SFU’s new apartment-style residence voted 95 per cent in favour of calling it Louis Riel House. Names like “Mountain View” and “Hillcrest Manor” were voted down in favour of becoming the first place outside of the prairies to be named in honour of Riel. It was a minor victory for the name Louis Riel at SFU, as it achieved a status that had only previously been earned by heroes like Madge Hogarth and the Shell gas corporation. Being the namesake of a student residence may have seemed like slight compensation for failing to replace Simon Fraser, and right from the get-go the Louis Riel House was not a particularly popular place. Within a month, Louis Riel was already charged with a litany of student complaints. From parking difficulties to a lack of cigarette and Coke machines, these problems eventually dissipated, but over the years they have been replaced by even more pressing concerns including unfit living and air quality concerns. The reputation of the residence building has only furthered the damage to the name Louis Riel on campus, already besmirched in favour of Simon Fraser in ‘68. Yes, Simon Fraser, a figure who Allan Cunningham, the inaugural head of history at SFU, once stated had a story which didn’t justify “more than a monograph,” remains the namesake of our school. Much like what Louis Riel the man means to Canada, ‘Louis Riel’ the name represents a portion of SFU history where students had the passion and energy to rise up and demand change. Having our university bear his name would have been a tribute to our radicalism. But is that really what the SFU story is about? Or is our school’s almost 50-year history better represented by a somewhat glorified but mostly boring and insignificant journey, like that of Simon Fraser? Either way, it looks like “Simon Fraser” will probably live on forever as our institution’s namesake. Maybe there will be another movement someday to change it, but just like those who dreamed up Louis Riel University, they’ll probably just be invited to consult our original name, FU.